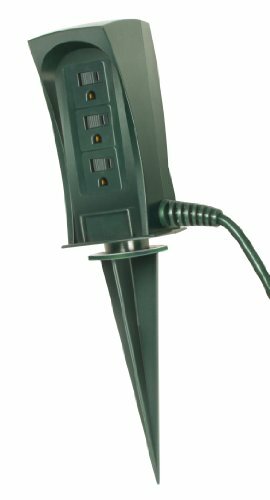 Yard Master 12428 3-Outlet Power Stake and 15-Foot Cord. 15-foot Yard stake with outdoor cord is super flexible and light weight, for less tangles when using. A 16/3 cord means the wire thickness is 16-gauge, and each plug has 3-prongs. 13A rating at 125V, 16/3-gauge, SJTW(rated weatherproof). Commonly used for appliances, decorative lighting, electric grills, spas, bug zappers, and other outdoor applications. 3-outlet power blocks save the cost and clutter of running two or three cords for tools and appliances. Green colored extension cord blends in with your surroundings. Jacket resists moisture, chemicals, oil, abrasion and prolonged exposure to sunlight. Heavy-duty strain relief protects electrical connections resulting in longer cord life. Easily add 3 accessible outlets outside, ideal for various special landscaping projects. Industry Approvals: UL Listed. Yard Master (TM ) is a registered trademark of Coleman Cable Inc.